The front crystal is either acrylic or sapphire, please choose at pull-down order menu. In April 1961, commissioned by the first ministry of light industry, Tianjin Watch Factory embarked on a secret project coded D304 to research and develop aviation chronograph for the Chinese air force. Borrowed design ideas from Venus 175, the special task force managed to trial-produce 32 pieces by December 1963. 1964 was the year to make improvement. D304 passed accuracy, high-low temperature, vibration, anti-magnetic, anti-moisture, all tests in October 1965. Jointly approved by 21 administrative units in December 1965, it went into batch production, caliber # ST3. By October 1966, 1400 pieces were produced. Total 3000 pieces were produced by the end of 1968. D304 was made exclusively for the air force, never commercialized for sale to the general public, thus it remained unknown until recently. Sea-Gull started to rework on ST3 in 2002. The structure of escapement system was modified to be more reliable; modification was also made to the structure, size and cosmetic appearance of some parts, the material of lever and spring, the versatility of various small parts. The improved ST3 is the current ST19 serials. I love this watch. 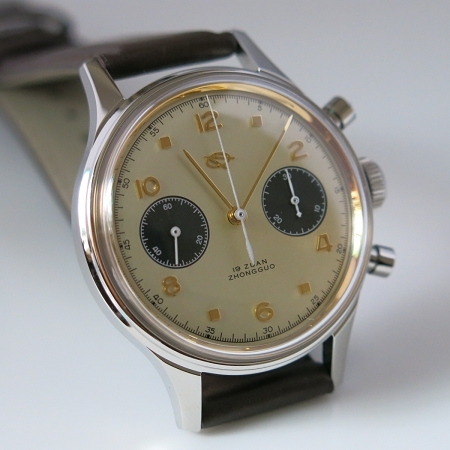 This is a clean, refined and beautiful watch.